"25 New Offices in 2019 – The Franchising Opportunity in the Language Industry" posted on 3/20/2019 at 5:18 PM by Alex Buran. The bar is set high. Let’s face it. That’s the challenge and I, the founder of Translation Cloud, is going to face. We’ve been in business since 2002. No kidding. The business grew every year since 2002 and fast forward to 2019, we’ve decided that it is the time to scale the business up and offer opportunity to like-minded entrepreneurs to join the firm. The business opportunity in the language industry is immense. Despite machine translators taking up a portion of profits, there is a growing amount of user generated content that no one can fully address. The big data. The noise. The humongous amount of human content that needs to be conveyed to all people in the world, not just americans. The industry shows an annual 5 to 8% growth according to Common Sense Advisory and it still going up in full steam. In order to accommodate such a vast need for language translation services and offer our laser attention to each customer in all major cities, we have embraced the goal of opening a franchise and giving our fellow freelance linguists to buy a license and operate under our brand and have our full support. Building a business from scratch is risky. Attracting new clients from the internet where cost of click is constantly growing and all social media are becoming prohibitive, is a doomed approach. The times when it was nice and easy are long gone, unfortunately. Franchise, on the other hand, is a less risky business. There is an established company, fully documented business process, organized training and support. It takes lots of concerns out of the way so you can open a new office, get everything organized and new clients will start coming in! Let’s be positive, folks! Let’s set the audacious goals. 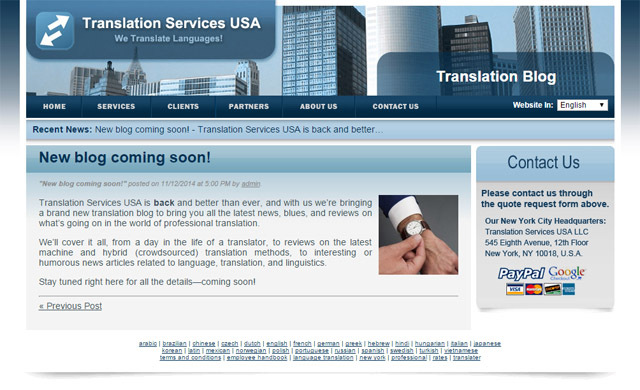 Let’s open 25 offices in 2019 and make Translation Cloud one of the largest language translation companies in America!